Tips to fix if a Jio SIM card is not working or showing No service, Emergency calls only and not showing any network or signal 4G phone. Reliance Industries came up with a bang in the telecom sector giving a sheer setback to its peers. The offers, plans and freebies offered by the Jio can make anyone have goosebumps. After its so-called Beta testing phase and preview phase, the Jio is now in stores as commercial launch. It offers Voice over LTE (VoLTE), high-speed data and other quality services. But with such a wide scale launch there will always be issues with calls, call quality, call drop and network stability. Reliance Jio Infocomm is said to be world’s biggest startup with over Rs. 1.5 Lakh Crore invested in this mega project. The company has acquired rights for 4G services in all circles of the country. Of course, it is too early to talk about the success of the project but for sure Jio has created ripples across the telecom sector of this country. If you have bought a Jio SIM and if it is not working or you are facing any technical glitch like no network signal, internet not working then here are some tips to fix the problem. 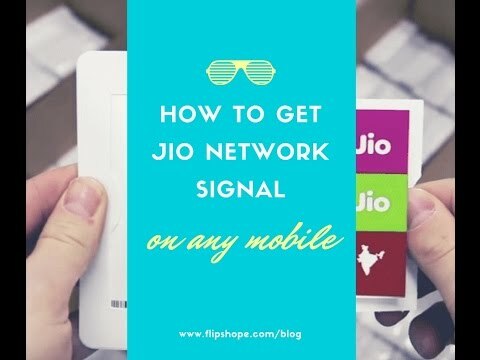 If your Jio SIM is recognised but you cannot see any network signal then following steps will fix the problem. If your Jio SIM is not showing any signals then you need to first set Jio Digital as your default SIM for internet mobile data. Step 5. Then check for the option called Network Mode or Preferred network type and click it. Step 6. You will find three options called GSM only, WCDMA only and 4G/LTE. Step 8. Restart your Phone. You will see your SIM working with Data. Step 6. Reboot the phone. Done! If APN is not automatically set then manually change the setting and set a Jio APN. Settings > Mobile Networks > Access Point Names. You can also manually select the network operator by going to Settings > Mobile Networks > Network Operators. Just simply open the MyJio App and click on first option i.e manage Jio Account and simply click skip sign-in. You can access the unlimited data. Flight mode is the best choice when you wish to have a mini SIM switch off. When you turn ON the flight mode, the device performs a mini switch OFF cutting the SIM cards from power and then after few seconds when you turn OFF the flight mode, the device will recognise the SIM networks eliminating any signal instability. The internet data will work fine. Make sure your SIM is activated. After you have bought the SIM, you will first receive the SMS of document verification on your alternative number followed by another SMS regarding Tela-Verification within a couple of hours or days. Ones its done you can insert the SIM in your mobile and enjoy the services. You can contact the Jio on their customer support. Download Jio Security from Google Play. Open the App and grant all the permissions prompted. Scan the phone and change all the apps to trusted if it shows risk with some Apps. Make sure the device is 4G enabled and supports Band 40 (For some states Band 3 and Band 5) for which Jio offers its internet. If your device doesn’t support the Band owned by Reliance in your state then 4G will not work on your device. Also, remember to use SIM Slot 1 for Jio SIM to catch the network. Make sure your devices support voice over LTE. If it does then just download the JioJoin App from Google Play Store, log in with your Id and password and make calls over voice. This will surely fix the problem. Flight mode is the best choice when you wish to have a mini switch off. When flight mode is ON it is like a mini switch OFF it will disable the SIM cards from power and then after few seconds on turning OFF the flight mode. The device will recognise the SIM networks and hence will show the network. This if you are facing any unstable network can help you fix the issues on Jio SIM. Conclusion: With the above methods you can fix all the SIM networks issues on Jio. Check the SIM card for other devices. If after doing everything it doesn’t work for your smartphone then there are some software or hardware incompatibility on your phone. For any assistance please comment below. You can also Join the Jio Community on Google Plus. If you've any thoughts on Fix Jio SIM for “No Service, Emergency Calls Only” (Not Working), then feel free to drop in below comment box. How to Hack Reliance JioFi Portable Wi-Fi and Hotspot Router ? How to Unblock the Site Blocked by Network Administrator? Hi I heard that if we opt for the welcom offer from Jio reliance Jio will block your sim slot on the phone so that u will wont be able to use other 4g services in that, is it true ? Its not true. The message is just a hoax. I ahve 4 G LETV – LEX509. Sim cardbars shows nework but not able to connect 1977. I visit in reliance digital store kamothe navi mumbai. They told they don’t have any idea about ist. Make sure you sign up or skip log in in MyJio App first. Nikhil, I have bought the sim Registration and activation is also done.. Network is showing i can also receive calls on my JIO sim.. But i am unable to call or use internet..! Just Open the MyJio App and Skip Sign up. You need to download JioJoin App to make calls. Also make sure you ave selected Jio as default for data usage in your SIM Manager settings. Using reliance jio in coolpad dazen 1 by miui 7 rom. Internet is running well but jio4gvoice is not connecting calls. Everytime call ended ny itself. Tried everything but not succeed. Is there any solution?? help? The network is having call drops issues, which will be settled in future. i use i ball slide 4g2!also got a tele verification of my jeo sim and go through their instructions given! !ive tried all the above instructions but still not working?data can’t be on? ?how to fix this?? Signals are available & I activate unlimited plan also but am not able to use jio Internet, is any solution….. Aveleble? Hi Nikhil, I have nexus 5. Have done all the settings properly but jio4gvoice app is not connecting and asking to sign in to jio network. Jio network says I am on welcome offer so can’t recharge the number. Don’t know what’s the issue here, can u pls help. Have MNP airtel to jio. I can’t use internet in Mi note 3 with Jio..why? ?what settings require?? I’ve been using jio sim since 1 month, it was working fine. Suddenly yesterday it stopped working. my device is HTC desire 728 dual sim. I have tried all the options. my no is not working showing no service .. or getting message xoami is waiting for sim activation .. i spoke to customer care to active my sim.. they guide me for mobile setting but still i am facing issue .. there is no network on my phone which is mi max. I update miui7 in coolpad dazen 1. How can I use jio sim without any barrier. I have change my phone but Jio is not working in my new phone , why? And what to do??? Coolpad devices have some problem with some frequency issues. I have moto g4 plus .. after using jio for 4-5 months. I removed my jio sim for some reason and then when I put it back my phone is not recognising the sim.. what should I do? Make sure the sim slot is set to 4G under network settings. Tnq so much …it wotked for me ….my problm was fix netwrok issur with ntwork radio.. . The flight mode turn on and off trick worked for me!! cheers mate!! Any troubleshooting steps for iPhone. I’m having issue with Jio since my very first day.. It shows 2-3 signals but call doesn’t connect. Airplane mode fixes problem but for a short period only. Mostly time it shows No Service. I’m having iPhone 6s. I lost my Sim, went to one nearby store (Nanganallur, Chennai) and they took my documents and photo and they gave me new sim and said it will be activated in 24 hrs.. But even after 48 hrs my sim was not activated.. Complained with Jio and registered complaint and nothing so far.. Reached the store twice and both the time they said, they will call back and they never did.. And after that their phone is always busy, meaning they have put the phone out of receiver!! Beware guys, Jio begged us all to get our documents trading for a new sim for free.. And when its done now, they are showing their true faces.. Airtel and Vodafone are much much better and safer.. Months ago, i went to one of their stores (Perungudi, Chennai) to replace my old sim to a new one. Because with old sim (bought in 2016), i was able to make calls only through my Jio’s dialer on my Honor Bee 2 because of with i was not able to use conferencing or Truecaller. But when i checked the same with my friend’s sim, i was able to make calls with direct phone’s dialer with data enabled!! All i wanted to use was true caller, which was then working with normal dialer on my phone either. So i explained all this to the Perugudi Jio Store guys and they were so lazy that they did not even listen to what i was trying to say and rudely said “Sorry, your phone doesnt have VOLTE facility, we cant help”. So i walked away from their store. PLEASE AVOID JIO AT ALL COST. Hey, thanks for the help. Seems Jio doesn’t play nice unless it’s the default data sim.